A mere hour and a half west of the city is Historic Elora. A beautiful town where the people are friendly, the streets are clean, the air is fresh and all of the businesses are locally owned. The streets have sculptures made by local artists and there is no shortage of galleries displaying their works out front. We came all this way for a Culinary Walking Tour and we came hungry. The tour met at our first stop where we were introduced to Harrison, our fabulous tour guide. 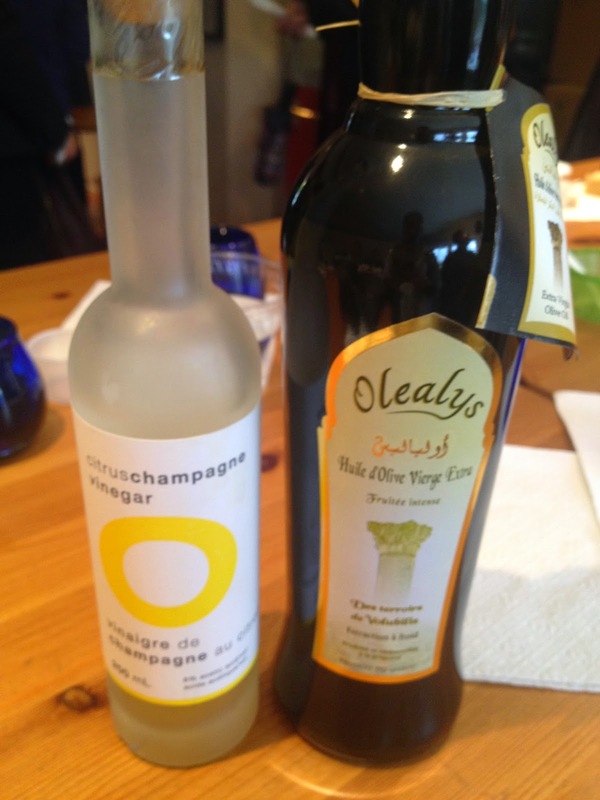 The Village Olive Grove is a gourmet extra virgin olive oil and vinegar shop that imports from all over the world. There we learned how to tell if extra virgin olive oil is authentic and how it's made. We also learned how to taste vinegar without the acidic flavour getting in the way. Just when you think you're a foodie, you learn something new! Love it! Last, but not least, we sampled Mapleton's Organic Ice Cream. It was flavoured with dandelion. It had a mild mocha flavour. Pretty good! We all looked worried when he said it was made with dandelion, but were all impressed none-the-less. 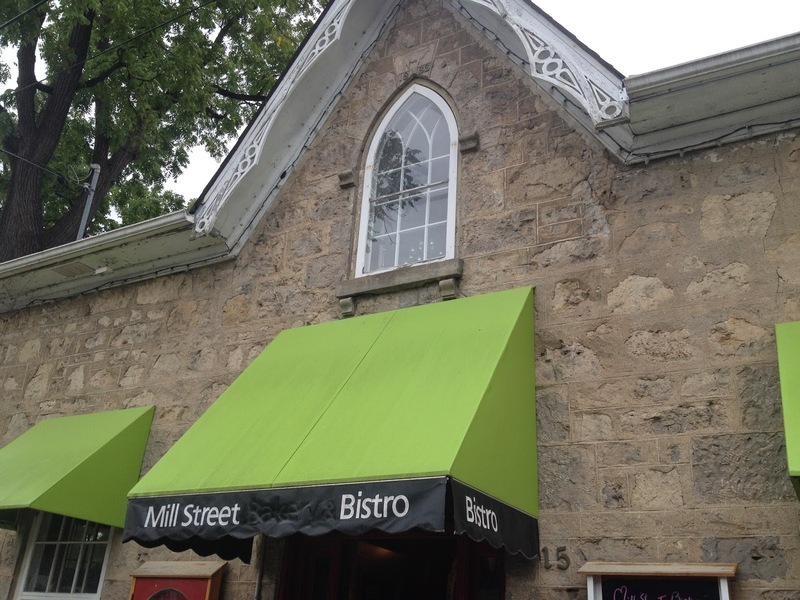 Our next stop was Mill Street Bistro. This was a house converted to a restaurant with a patio right on the Grand River. Great view! Here we were served their Signature Mac & Cheese. 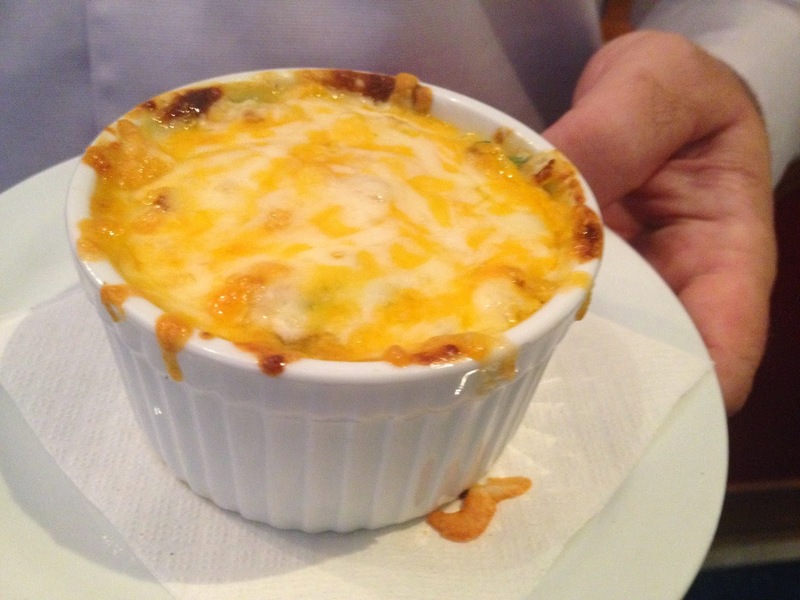 The creamy cheese sauce with spinach and tomatoes smothered in a dangerous mix of melted cheese was to die for. We all wished we had a full serving! For a pasta dish, it wasn't heavy; the sauce was creamy, but light. A savoury start! Let's keep it going! From there, we stopped by Cork. Greeted warmly and seated, we enjoyed the clean lines of the monochromatic décor. This looks like the perfect place for a date. 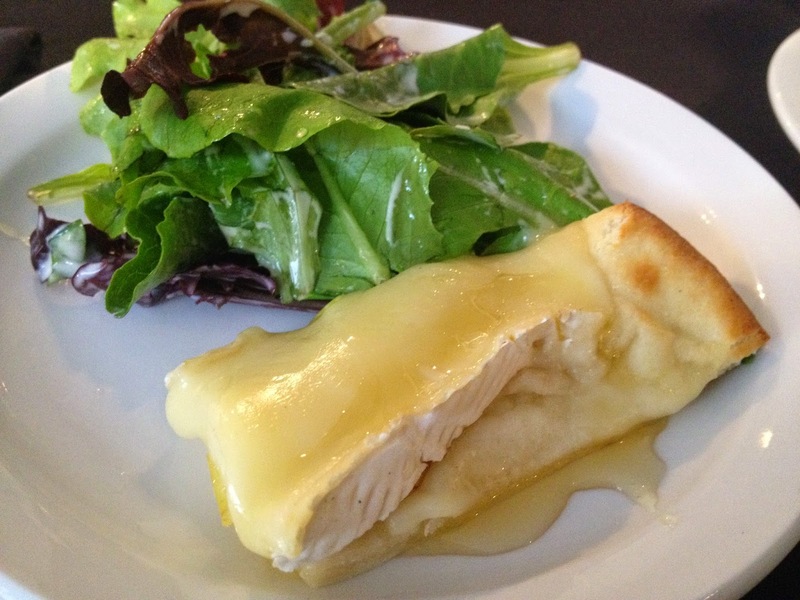 Our sampling was the Brie & Pear Flatbread with salad topped with house dressing. I could eat brie with pear everyday and that day was no exception. The flatbread was fresh and together it was delicious. The salad was alright; the dressing was good, but the greens were a little blah. I definitely could've gone for more pear and brie! After those savoury dishes, it was time for some sweets! E & G Pastry & Fine Cakes were armed with some sweet treats. 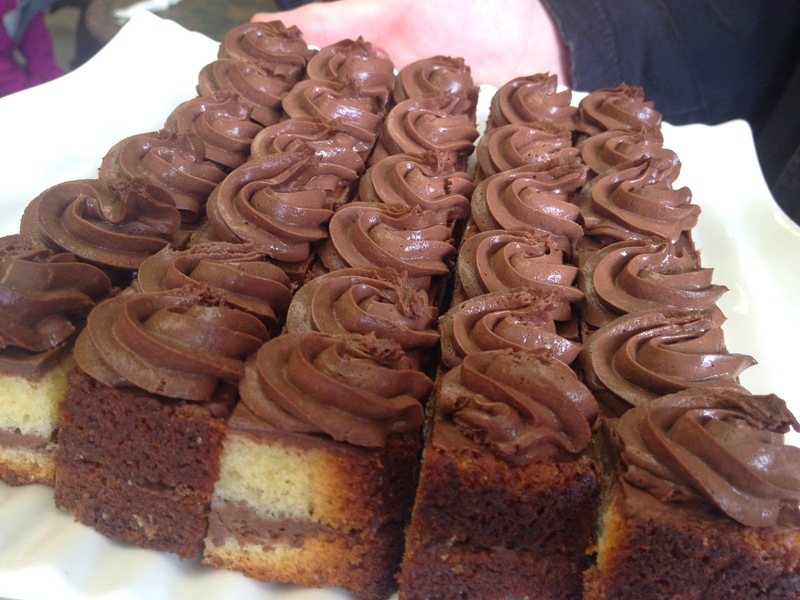 The first taste was Marble Chocolate Cake. Yes, yes and yes. The cake was moist and the icing was rich, but not too rich. They made a little extra, so some of us had seconds. I have no shame; I was absolutely one of them. The second treat was Baklava. I've never been a fan of baklava. Tried it a few times, but meh....until today. It was flaky, fresh and sweet all over. I don't know what they did differently from the rest, but it was good. It didn't have the 'my teeth hurt' effect other baklava has had on me. It was a winner in my books! Just down the street, we found ourselves at the Elora Bread Trading Company. A relatively new business in Elora, these ladies work hard and sell out almost every day. 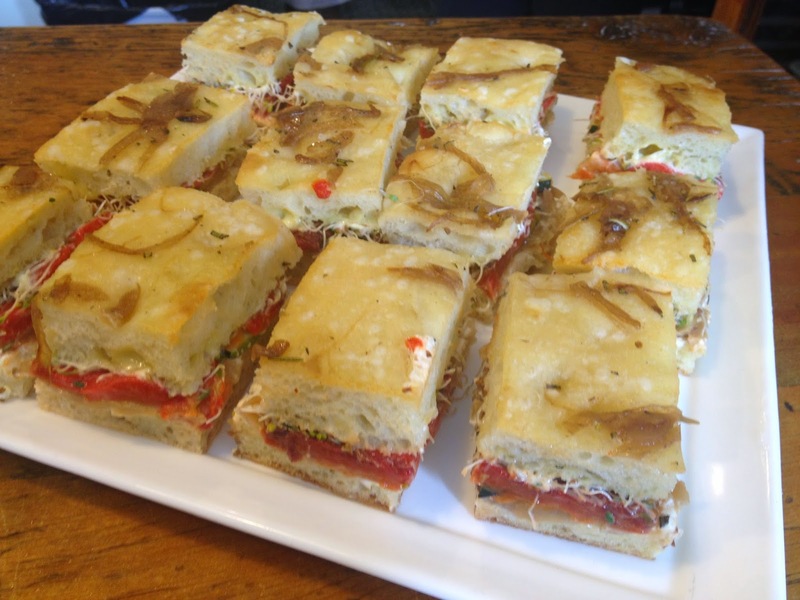 They presented us with sandwiches on fresh focaccia. It had house made mayonaise, roasted red peppers, zucchini, sprouts and goat cheese. OMG. I can't even think of a word to describe how fantastic this sandwich was. I'm a meat eater, but this won my heart(and possibly some of my thighs). To another venue with a Grand River patio, The Cellar. A pub with a modern feel, I would consider this a gastropub; not just pub food here! 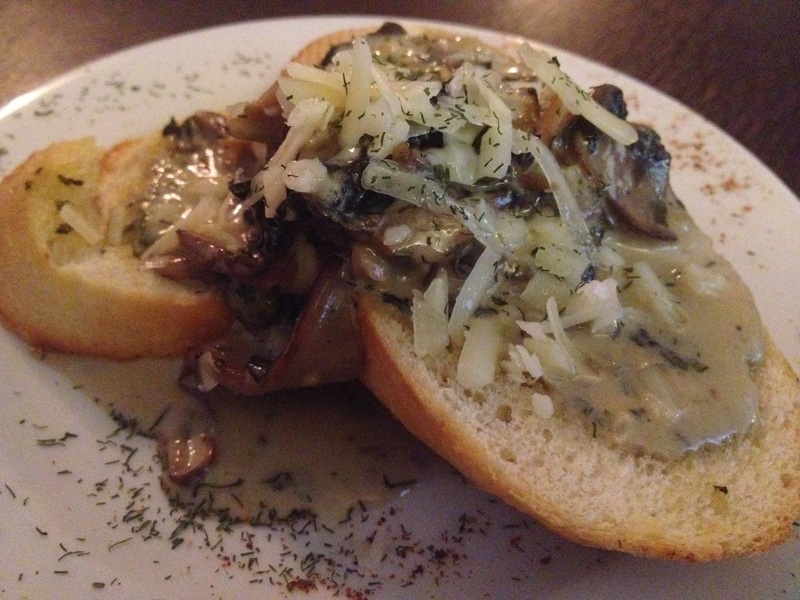 Sauteed mushrooms topped with mozzarella on crispy, fresh loaf and sprinkled with basil. Another winner! This dish was very well balanced, not too savoury, not too salty. I couldn't find it on the menu though; the people are missing out! The second last venue was Shepherd's Pub where we were given a sampling of local brew, Stone Hammer Pilsner. Stone Hammer is brewed out of Guelph, Ontario and they make 7 different beers. Shepherd's Pub has many local brews on tap. This place had a comfortable vibe perfect for having a good time. Even though it's in the lower level, you can still sit at the back and enjoy a view of the Grand River. 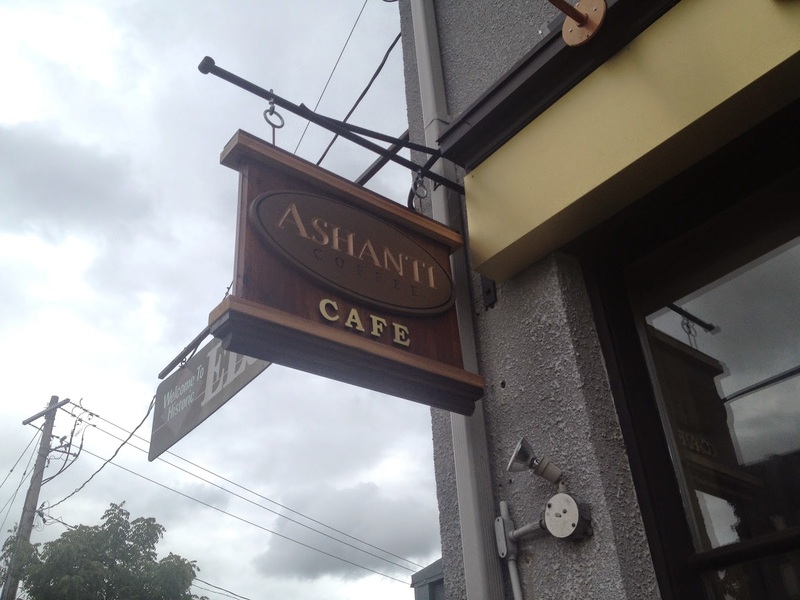 Our last stop was right next door at Ashanti Café. The owner is very passionate about his business and supporting other local businesses. This location is the only franchise; the other locations are owned by the company. He enjoys that Ashanti owns the coffee plantation, ships it here for roasting and distribution. He advocates how the plantation is run, telling us that they provide a hot meal and lodging for the workers in Zimbabwe. Impressive, but how is the coffee? Smooth. I tried the light roast and it was great. The baked goods that stared at your while you enjoyed your coffee were from bakeries right here in Elora! While we toured, Harrison would stop and tell us the history of the buildings we were walking by or going into. This was more than just a food tour, it was a history lesson! Our guide was pleasant and knowledgeable. He did a fantastic job! Thanks, Harrison! The Elora Culinary Walking Tours run year round for groups up to 20 people. All of the stops on the tour are support local farms and businesses which is alright in my books! The weather was perfect that day, but it runs rain, snow or shine! A great day trip out of the city!